We named him Darius. I’m not sure why. I said we needed to come up with a name for our pet porcupine and Karl suggested it. Every morning and every evening Darius would waddle out from his spot under the chicken coop and eat apples. For a wild animal, he was surprisingly docile. I could walk close enough for pictures. He would look at me blandly and continue munching his apple. We first saw Darius when I let our dog out of the house one evening. Maggie ran straight towards the chicken coop. I watched her do her play-with-me dance that she does with our cat sometimes. A crouch, a pounce, a jump back – tail wagging the whole time. When I went to investigate, I saw the porcupine. “Call Maggie,” I yelled back to the house, and the kids did. The last thing I wanted was a visit to the vet for quill removal. Fortunately, Maggie is fairly obedient and went back inside. Darius waddled into the woods. On successive nights, I watched him squeeze into a gap underneath the unused chicken coop. I warned my brother and sister-in-law about the porcupine. They have two puppies that are still learning obedience. Bear and Bozeman might have been more aggressive in wanting to play with a porcupine. Toward the end of Darius’s visit, he stopped going under the chicken coop. He stayed under the apple tree all day, nose toward the trunk, sleeping. One day, someone threw an apple at him. “I wanted to see if he was alive” was the response. But his behavior worried me. 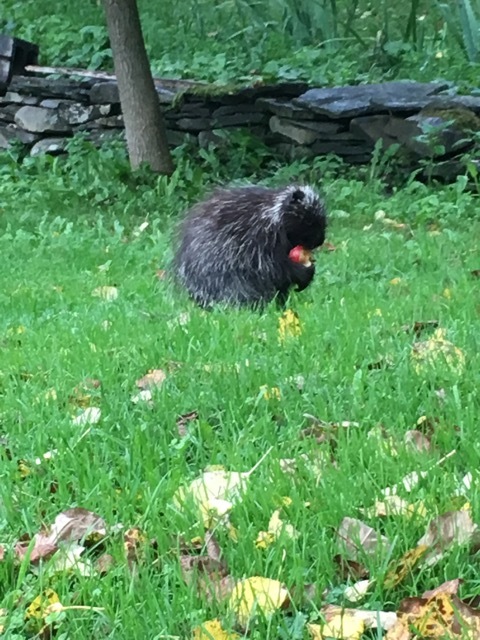 It’s not normal for a porcupine to sit out in the open all day. I called the animal control officer. “I can come right over and shoot him,” he said. “I was thinking more along the lines of trapping him,” I replied. I couldn’t stomach the thought of him shooting Darius. Years ago the police came to shoot a sick raccoon in our backyard in Cooperstown. We saw it staggering around in broad daylight. My boys watched from the window while the policeman “took care of it.” But nobody was attached to the raccoon. We hadn’t watched him eat apples or named him or anything. I walked up to explain matters to Darius. He was still sitting nose-to-the-trunk under the apple tree, but he bristled right up when I approached. It was the first time I had seen him do that. I decided not to tell him. I just studied him a while, wanting to store him in my memory. Later in the day, I saw him trekking across the backyard and into the orchard. He picked a dwarf apple tree and climbed it. Later Bud saw him the street and head down into the pasture. 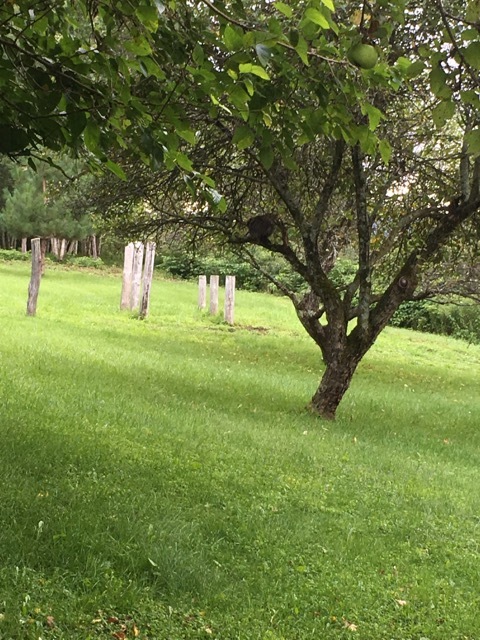 In the evening, Bud and I walked around the apple trees in the pasture looking for him. I called animal control and told him the porcupine was gone. “He was my favorite porcupine,” Mary said, when I told her. That’s what happens when you get to know somebody. You wonder if summer heat has left him feeling a bit lethargic.